Superman continues to hallucinate that the people he loves blame him for their deaths until he is finally freed from the Black Vault by Amanda Waller. Meanwhile, Cyborg Superman and the Eradicator convince General Zod that they can help him get his hands on a Phantom Zone Projector. It takes some doing but Zod finally joins them though Zod insists that he is in charge. Back at Belle Reve, Superman has a tense exchange with Waller after finding out that she kept Zod as a weapon. He flies off and attacks Zod, Cyborg and the Eradicator but something isn't right about him and they defeat him with ease. Superman manages to escape but the battle attracts the attention of Supergirl, Lex Luthor and the Super-Man of China. Superman manages to get to Lois and Jon but the happy reunion is short lived after the Man of Steel reveals that his time in the Black Vault has left him blind. Story - 5: It occurred to me after reading the previous issue that this is the first time Dan Jurgens has gotten a chance to write General Zod. It's kind of amazing when you think about it. 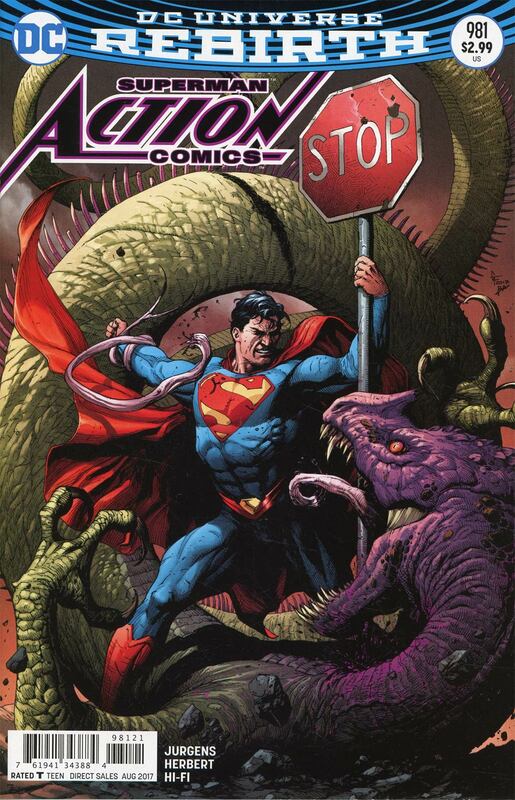 Jurgens worked on the character either penciling or writing or both for a decade and would come back to the Man of Steel from time to time until just before Rebirth. In all that time, he wrote or drew many of Superman's classic foes but because the powers that were had a policy of keeping Superman as the true sole survivor of Krypton the good General never showed up. 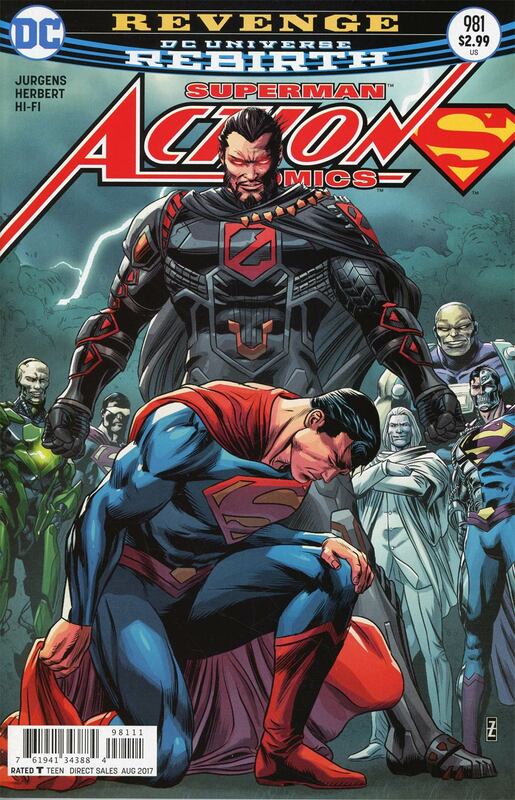 The closest villain Jurgens came was the character of Dev-Em, who was a Daxamite that Superman fought during the Time and Time Again storyline. Which is a long winded of saying that it's cool to see Jurgens finally getting to play with one of Superman's most iconic foes, at least in the mind of the public. This storyline keeps getting better and better. The first scene with Superman trapped in the Black Vault was suitably creepy. I liked how arrogant Jurgens played Zod and that even though he is working with Cyborg and the Eradicator he considers those villains to be working for him. Superman taking a hard line against Waller's methods continued in this issue and, like last time, it's great to see the Man of Steel take such a firm position on something. The fight was lopsided but that was the intention. Superman was on the backfoot the entire time and Jurgens teased out the reason nicely. The final reveal that Superman is blind had a great Silver Age feel to it and between that and the shots of the other members of the Super Family I am excited to see what's coming next. This was a great issue that is part of a great story. Jurgens is continuing to deliver exciting and engaging stories and it's great to see him finally get to write General Zod. Action Comics just keeps getting better and better. Art - 5: Jack Herbert turned in a fantastic issue and delivered a classic looking Superman. There were a few panels that seemed to have a bit of a Jerry Ordway influence but that might be me seeing something that wasn't there. The action scenes were intense. Flying battles are hard to pull off in comics but Herbert did a fine job of it here. Cyborg Superman and the Eradicator were on model and I really liked this take on General Zod. The final page was a little wonky, especially around Superman's face but it wasn't bad by any stretch of the imagination. Cover Art - 5: Kneel before Zod. A classic cover with amazing art. This is a poster worthy piece. Variant Cover Art - 5: This is an odd cover but Frank makes it look fantastic. I assume this is supposed to be Superman fighting in the Black Vault on some level. It may not fit the issue but it is a fine cover indeed.